SpongeBob Squarepants is truly one famous Character for every kid. My son likes the tv show and he enjoys watching the series. There are times that he copies those funny yet annoying quotes Spongebob was saying and I am surprised. Because of that, I think getting my son the costume for the upcoming Halloween would be great. I've been looking for a good quality, as well as a high-class style for this kind of outfit. I've seen some designs in our local store yet, I don't have that urged to procure it. I don't know, maybe I am not awestruck with its looks. Luckily, Costume Super Center gave me the opportunity to review one among the new costumes they have on their website. They carry a variety of costumes from adults to kids. After that, in order to avail discounts or awesome deals from them, why not like CSC on Facebook, to get connected with them. I was fascinated the amount of costumes they hold, and picking for the right SpongeBob outfit is quite harder than I thought. 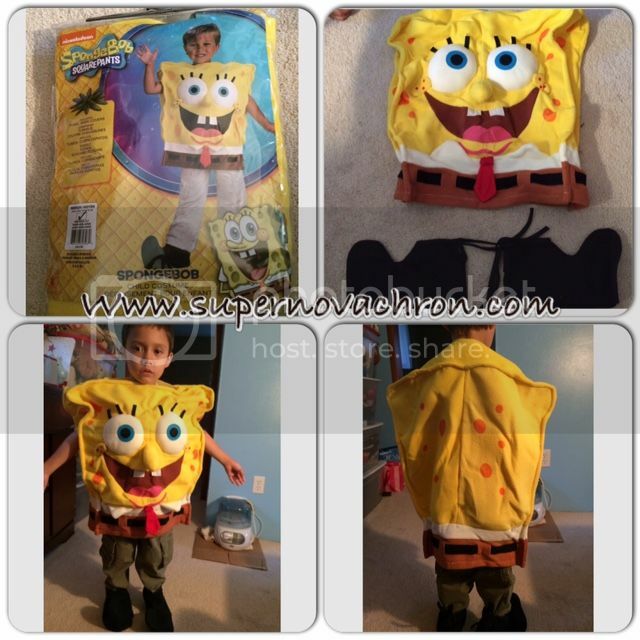 I've sorted through all the Spongebob costumes they carry, and finally decided to decide on one. And I selected the design that has my son's size and in which it looks vivid for the rest. The item arrives in the mail through the USPS. I don't see any signs of rough shipment that I was able to open the packaging box and inspect it right away. No rips, no signs of damage, all the accessories are there, I was happy with the shipment. The size I took was way too big for my son. Although it says right for his age, I should've known better that my son is skinny. Now I have to make sure to put a cardboard on his shoulder to put up a Spongebob's face properly and it will stay level. But the quality of the costume is very impressive. Very comfortable and warm fabric they use. The face is very vivid, the shoes that comes with it is also good. It needs to cover the shoes in order to look like Spongebob's shoe which has an open in the bottom part. Other than the wrong size I opted, I am very satisfied with the costume. Now my son would be very cheerful and thrilled to wear this costume during Halloween night. Oh wow, I love this and I am sure my son would love it too!